WIND Mobile officially turned the lights on in the K-W region today. There was over 200 people waiting in line to get signed up and also score a free data stick (video after the break). You can check out the coverage map here but they stated that Guelph and Cambridge will be up and running soon. In a press release this morning WIND confirmed a few details. First, they’ll be releasing another WINDSpeed data stick soon, the E366 (no price point was given). Next, they announced a network upgrade is currently happening that will see speeds increase from 14.4Mbps to 21.1Mbps, which “will be available to all WIND customers at no additional cost”. Finally, here’s an interesting stat. 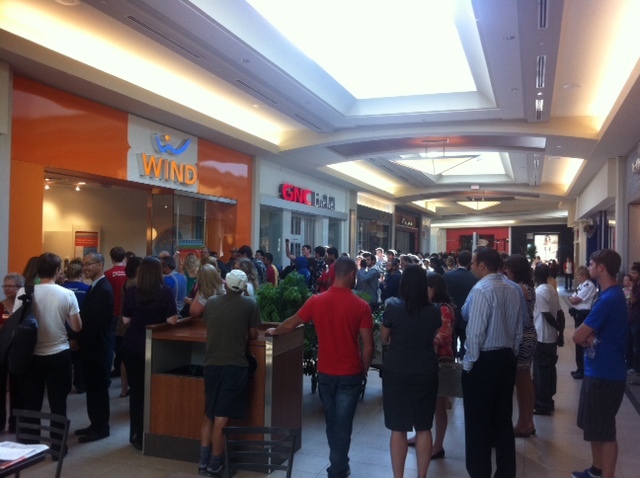 Last week it was revealed that at the end of Q2 2011 WIND Mobile had 317,000 subscribers. In the press release today WIND said that “One hundred per cent of WIND customers are data-enabled, and about half are using smartphones”… so about 158,500 are using a smartphone.